This week I did something unthinkable for me. I sent emails to two different friends, to tell them I could no longer contribute to their websites. I politely and graciously "resigned". I had to keep the emails short. They were painful. These women have become my friends and not only did it make me feel like a failure, like I couldn't handle it all, but I also felt like I was letting them down, and that made me sad. Everything came to a head a few weeks ago while I was reading "Carry On Warrior" by Glennon Doyle Melton. The book is full of stories from Momastery.com. About half way through I had this overwhelming feeling that it was time to stop hiding and be more honest with myself. Honest about what I can and cannot do. Honest about what I want to do, and honest about who I want to be. The book is amazing that way. I realized what I already knew. Being a wife and mother is hard, and that is okay. Admitting it is hard doesn't make me less or worse. I have been struggling with this turmoil inside for a while now and didn't even know it. An unsettled feeling that was trying to tell me to get back to basics and actually live. Live side by side my children and love each and every moment. That is what I want. I want to laugh more and play more and be silly more. I want to rush less and worry less and stress less. I want to put my whole heart into the few things that matter most, instead of putting a little heart into lots of things that don't matter. What really pushed me over the edge was Billy Joel. Yep, Billy himself. You see, I am a huge Billy Joel fan. Always have been. My husband, not so much. So while he was gone I put in "The Best of Billy Joel" and turned up the volume. I have lots of favorite songs, but up there at the top of the list is "My life". I was signing, signing loud when it hit me. Maybe you know the song. Either way it's okay you wake up with yourself. Yes, thanks to Billy Joel it all clicked. You see no matter what anyone else says or does or believes, I wake up with myself every day. I have to be happy with me, content with me, and honest with myself. And I have to accept that that is enough. And it is. When I open my eyes each morning, I have to feel good about who I am, because either way it's okay, I wake up with myself. And for me right now, I am someone who needs to cut back and accept all I give. For it is enough even if it isn't everything. So I "resigned" from a few positions. And you know what, my friends understood. They were supportive and wonderful. And then I "re-hired" myself. To the most important position I have ever been blessed with. Being married to my husband and mother to our children. This doesn't mean that I can't have any other interests. For example I feel strongly about getting back to Family Volley. And I am passionate about the LISTEN TO YOUR MOTHER Show that I am producing and directing. But those things still feel right. The other obligations, not so much. Thanks Momastery.com. And thanks Billy Joel. Thanks for giving me courage to do what needs to be done. 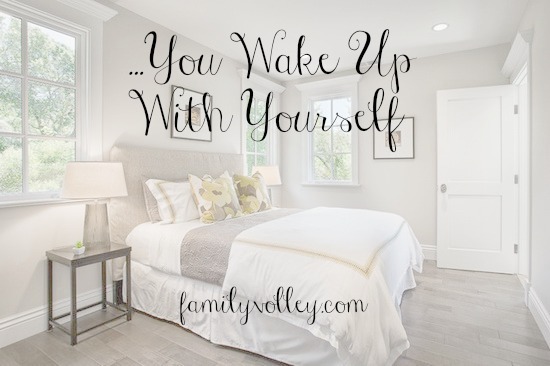 Thanks for helping me feel better about "...waking up with myself." Do you ever feel guilty saying "No"? Do you feel like you have to do it all? Good for you! All mom's struggle with this. Thanks for inspiring all of us to do the same. We should have a national, "Mom's Say No Day" when we quit at least one thing we really don't want to do (that's also not good for our families - if only I could say no to emptying the dishwasher:)! Can't say no, but I'm learning. It helps when you are so busy and life is falling apart cause people don't ask as much. I say no, and sometimes I feel guilty, but I say it anyway. It took me a LONG time to learn to take care of myself so I can better take care of everyone else. It is SO hard to say no to good things. I'm trying to figure out what is out of balance in my life and bring it back to where it should be. I LOVE Momastery and Glennon - just finished the book. Thanks for sharing your inspiration. SO true!! So proud of you dear lady and friend! I can't wait for your upcoming show I am sure it will be a hit! It's hard to make that choice but it sounds like you're better off for it. Oh, I totally get it. I had that realization a few years ago that it is MY life, and if I'm not loving it... it's MY fault. I have a whole "Just Say YES" project going on in my blog about how I'm saying YES more to the things that are fun and exciting, but the flip side is that I am really saying NO a lot more often too, because I look at things in the mindset of, "Is this going to make me love my life, or take me away from what I want to do."